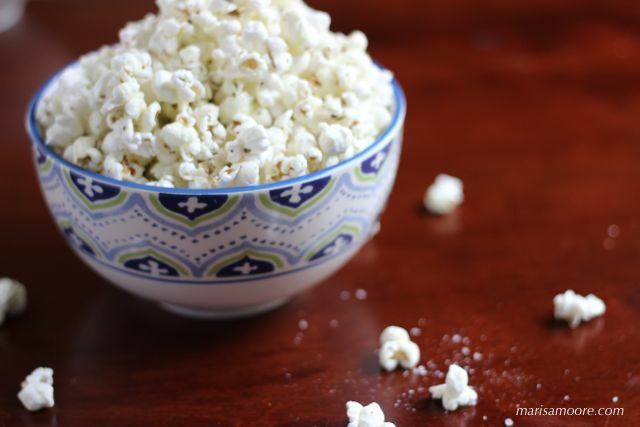 This vegan Smoked Sea Salt Popcorn recipe was inspired by the bacon-flavored popcorn at one of my favorite Atlanta restaurants. In the spirit of Halloween, this month’s recipe redux theme is spooky spices. You know – the herbs you bought and used once or those jars of obscure spices you somehow acquired but just can’t seem to part ways with? I’m sure you can relate. When I saw the theme I checked to see which spices were lurking in the dark corners of my pantry. Because I recently cleaned and reorganized the pantry, there weren’t many extra spices hanging out in there. I did find a few that I purchased with good intentions yet never cracked the seal. 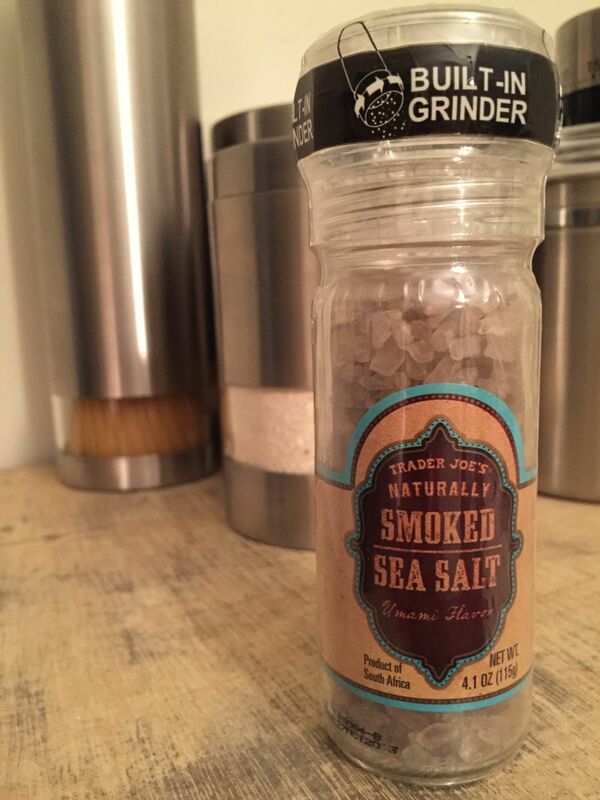 One of which was this Smoked Sea Salt from Trader Joe’s. I thought… what better time than now to crack that seal? I started thinking about all things smoky which naturally led me to bacon. And those thoughts of bacon led me to the popcorn at The Shed at Glenwood. Instead of the usual pre-meal bread and butter, the folks at The Shed serve up little bowls of smoky and slightly addictive bacon-flavored popcorn. And that’s what inspired this recipe. In a small saucepan, combine 1/4 cup olive oil, crushed garlic cloves and Italian seasoning. Heat over medium heat just until the garlic is fragrant, not browned. Remove the garlic from the pot and briefly set aside. Add 2 tablespoons of olive oil and 1/3 cup unpopped popcorn kernels to a large, heavy-bottom pot. Cover and turn the heat to medium-high. Listen. As the kernels pop, shake the pot to make sure all kernels are heated. Periodically open the lid to allow steam to escape (away from you). Once the popping slows down, remove the pot from the heat and remove the lid. Add the popcorn to a large bowl. Drizzle the hot popcorn with the warm olive oil and herb mixture. Sprinkle with the smoked salt, toss and serve immediately. This popcorn is delicious served warm. Store any leftovers in an airtight container to enjoy as a snack for 3-4 days. Recipe inspired by the bacon-flavored popcorn at The Shed at Glenwood restaurant and adapted from giadadelaurentis.com. Final verdict on TJ’s Smoked Sea Salt? Ehhh… I liked it but I wanted a more pronounced smoky flavor. Next time, I will try one with a bolder flavor… maybe a hickory smoked salt. Check out the recipes below to see what the other Recipe Reduxers brewed up with their “spooky” spices this month.